Today, I have Beth from 19elephants here to give you a fabulous tutorial on a great personalized baby gift. Beth has some great stuff on her blog and I highly recommend you head over and say hi… after you check out her fun tutorial, of course. So, let’s get to it! Hi!! I am Beth from 19elephants. I am so excited to share with you my tutorial for a Personalized Taggie Lovey. I made my first taggie lovey when my daughter was 4 months old. She LOVED playing with and chewing on the tags on her toys. I had seen taggie lovies before, so I decided to try to make one. I couldn’t resist adding a personal touch and putting my daughter’s initial on her lovey. She still loves to play with it, and I have enjoyed making more taggie lovies for baby gifts. I always like to give a gift that is handmade, and I love that this is a gift that the new baby can use early in life. I also love this project because you can put so many personal touches on it, and the possibilities for color choices are endless. You can also use as many or as few different colors and kinds of ribbon as you want. This is my first tutorial, so I hope it is easy to understand, and that you have as much fun making your taggie lovey as I did making mine! *A stencil for your letter. I simply chose a font I liked, made it the biggest I could to fit on one page, printed it off, and cut it out. Iron your cotton fabrics. Cut your large background piece and fleece piece to 11″ x 11″. I like to use my cutting board and rottary cutter, but scissors work just as well. Using your stencil that you have made, trace your letter on the BACK side of your smaller piece of fabric. **Make sure that you trace your letter backwards, so it will be correct on the right side of your fabric. This is not as important when using a letter “A” like I did, but this is obviously very important when using a letter like “B.” I simply held down my stencil, traced around with a pen, and then cut it out. Place your letter on your square of fabric where you want it and pin it down. I like to place my pins in the middle of the letter, so I don’t have to worry about removing them while I sew down my letter. I have very little experience with sewing applique, but this is a pretty simple project to start with. I use a zigzag stitch. You do not need to backstitch when sewing on your letter. We will pull our threads through to the back and tie off when we’re finished. This gives you a nice even stitch around your letter. When sewing around the letter, keep the right side of your stitch just past the outside of your letter. You want your stitching to be almost exclusively on your letter (on my green fabric). Make sure that your needle is in the down position when turning corners. To keep your corners nice and neat, sew until your needle is on the right side of your zigzag stitch, turn your fabric, and keeping sewing. When sewing around both a straight part of your letter, and a curve, keep your foot in a straight line. This will give you even stitches. When you come back to the beginning of your letter, do NOT backstitch. When pulling your threads, hold them down against your fabric to prevent your stitches from pulling. You can either thread a needle, and sew your threads to the back of your project, or you can use a simple trick that I like to use. Turn your fabric over, and on the backside pull your threads. A small loop will form. Using the backside of your seam ripper, catch the thread and pull it through. Tie your threads together several times. Clip your threads. You will now have two knots. Don’t worry, no one will ever see this part of your lovey. Our letter is now attached to our fabric. Honestly, sewing around the letter is one of the trickiest parts of this project. Iron your project so it is nice and pretty, and ready for all the ribbon. There are endless possibilities when choosing your ribbon. I always have a lot of ribbon on hand because I also make hair bows, but this project can be done with two, or ten different kinds of ribbon. I like to use a variety of textures and sizes so the baby will have lots of different ribbons to feel. For this lovey I have chosen ricrac, satin ribbon in two different sizes, and grosgrain ribbon in two different sizes. I like to have a lot of ribbon on my lovies, but you can use as few or as many pieces as you would like. I used ten different kinds of ribbons in four different colors, and I needed four of each kind, so I cut 40 pieces of ribbon in all. Cut your ribbon in 4″ pieces. I like to lay my ribbon out so I can get a visual of what my lovey will look like. When making my first few lovies, I pinned each piece of ribbon on my project. ****IMPORTANT**** When pinning/sewing on your ribbon, make sure the loop faces inward on your fabric. This way when you turn your project, the ribbon will face out. I do not want to admit the number of times I have done this incorrectly, and realized it halfway through, and had to rip out my stitches and start over. Fold your ribbon in half and pin your ribbon along your project. If you are a type A person, this will probably be the method you choose because it will allow you to space your ribbon exactly how you want it to be. If you’re like me, and you’re not someone who thrives on orderly things (I wish I was more Type A, and I’m sure my husband does too!! ), you might want to skip pinning your ribbon. I put my ribbon in stacks in the order I want to sew them on my project. Now comes the fun part!! Using a straight stitch (don’t forget to backstitch!) sew your ribbon onto your lovey. 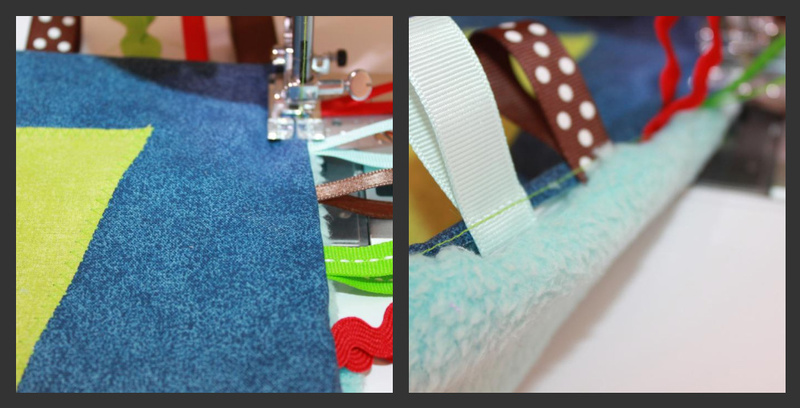 You want your ribbon to hang off your fabric about 1/4″, and I also sew with a 1/4″ seam allowance. Don’t worry, we will sew over the ribbon two more times, so it will be reinforced, and we won’t have to worry about it coming loose and becoming a choking hazard. Since I don’t pin my ribbon, I just add a piece every little bit. I like the variety and randomness that this gives to the lovey. Sew your ribbon on all four sides of your lovey. Tada!!! Doesn’t it look like so much fun?? I like to add crinkly material to the inside of my lovey to give the baby an extra little bit of delight. What baby can resist a fun, crinkly lovey?? I use empty plastic wipe cases that I have cut to make flat. If you don’t use wipes, you can use any kind of crinkly material. The bag that cereal and chips come in will work just as well. I would suggest washing it off so your lovey doesn’t smell like raisin bran or cheetos. If you prefer a noiseless lovey, skip the crinkly material. Lay your soft material with right sides facing. Then lay your crinkly material on top of your soft material. As you can see, my crinkly material is not quite 11″ x 11″. This is no big deal, you just want to make sure that your crinkly material is 11″ in either width or heighth, so it will be sewn to your project, and won’t get bunched up with use. Pin all of your layers together. Sew around your lovey, leaving about a four inch gap along one of the sides. Turn your lovey, and use a non sharp instrument to poke out the corners. I like to use a mid sized crochet hook. Doesn’t it look fun??? Wait, we’re not quite done. Now, using your zigzag stitch, stitch all along the outside of your lovey. I like to start on the side with my gap so I can take care of that right off. Simply fold in your fabric, ribbons, and soft material and zigzag stitch over the opening. I like using a zigzag stitch here for a variety of reasons. It ties in the color of your letter, it reinforces your ribbons, and it adds an element of fun to your lovey. Now you have a super cute, super fun, personalized baby gift. Enjoy!! I would love to see pictures of your finished lovies. If you have any questions, or there are any problems with the tutorial, please comment below and I will do my best to offer my help. You can find the lovies for sale in my etsy shop. Thanks so much!! Thanks so much, Beth! Sewing tutorials can be hard to write well. Isn’t this one fantastic?! And aren’t those just too cute. I might have to go order one for our new little guy. So, now you should go check out the other cute stuff at 19elephants, as well as all the goodies in her shop. I have been admiring these on your blog. Thanks so much for sharing!!! This is such a great tutorial!! I have to admit I am having trouble reading the gray on blue- my eyes must be going! My son loves the tags on all of his toys- this is such a great idea!